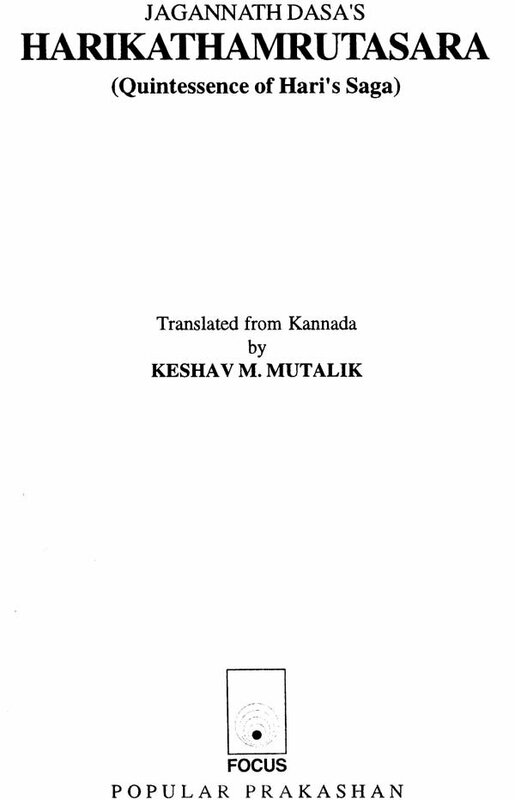 Harikathamrutasara by Jagannath Dasa, now translated into English by Keshav Mutalik, is a quintessence of Dvaita philosophy and a great contribution to Kannada literature. 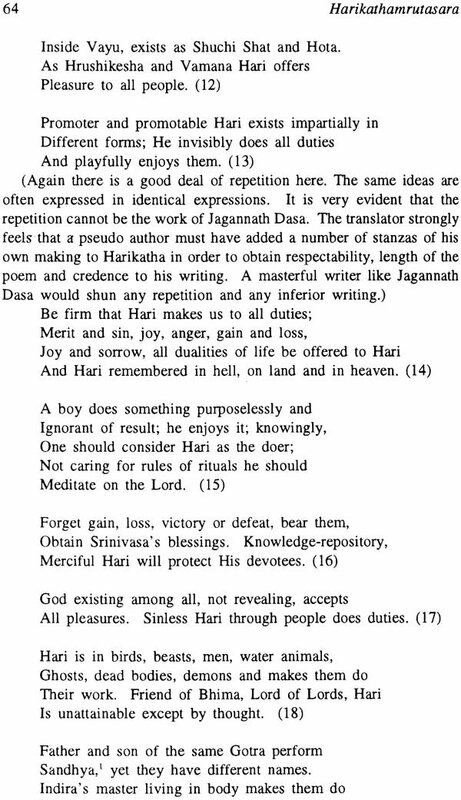 That such a great writing was fructified when Jagannath Dasa was eighty and that he, with sustained efforts, could write thirty-two Cantos is a marvel of devotion and blessings of God. The present book is a translation into English of the magnum opus of the same title achieved with the sole purpose of making the book appreciated by both non-Kannada and Kannada scholars and laymen. 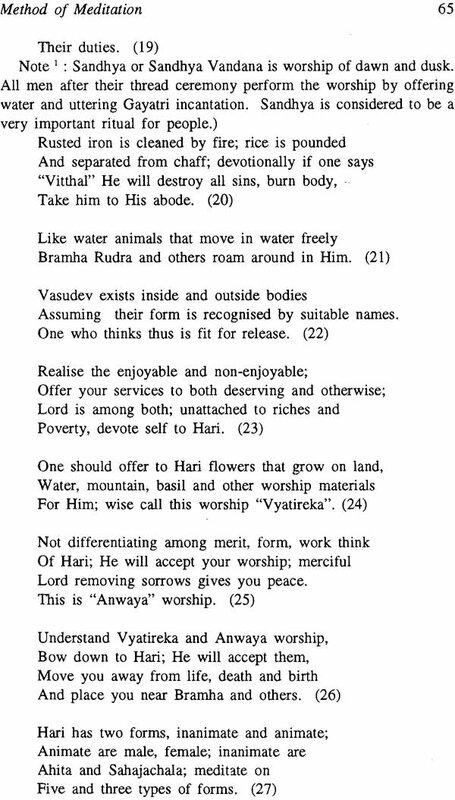 The translator has appended suitable comments for the reader to taste the sweetness and grace of Harikathamrutasara. 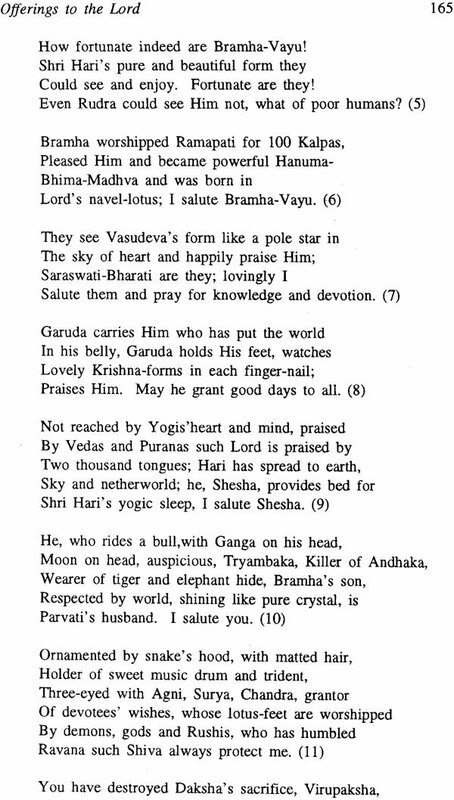 Jagannath Dasa poetizes "Bhakti" (denotion) in clear, lucid style. The reinforced it to highlight its dignity and grandeur. Harikathamrutasara, the poem celestial encompasses the great Indian philosophic writings of the Vedas, the Upanishads and the Geeta. The principles of man-god relationship enunciated in Brahma Sutra are clearly explained. The poems contain the beauties of religion, philosophy and literature. Dr. Keshav M. Mutalik retired as Principal, Sydenham College of Commerce and Economics, and then worked as Hon. Director of the Sydenham Institute of Management and Entrepreneurial Studies, which he started. Later, he was Director of the Maharashtra Government's Central Services Training Institute, Bombay. He earned a Ph. D degree from the University of Bombay for his work on Francis William Bain and other Ph. D. degree awarded by the Leeds University (U.K.) for his "A Socio Linguistic study of Kannada." Dr. Mutalik has established himself as a distinguished teacher, researcher and a connoisseur of drama and music. At present, he teaches Communication Skills and Research Methodology in The Mozambique-Tanzania Center for Foreign Relations, Dar es Salaam, Tanzania, where he is Associate Professor. Dr. Mutalik visited the U.S.A. as a senior full bright scholar where he studied Mark Twain's visit to India and produced Indian plays in translation. His study on Mark Twain is published under the title Mark Twain in India. Of late, Dr. Mutalik has undertaken an intensive study of Madhva Philosophy (Madhva Siddhanta) and has published books, Guru Raghuvendra Swamy, Jagannath Dasa, Shri Raghoottma Teertha, Songs of Divinity, and Harikathamrutasara, A Few Pillars of Madhva Siddhanta. His study of Vyasaraya Teertha, Vadiraja Teertha and Guru Madhva are awaiting publication. Thirteen years today the author's beloved wife, Kumud, suddenly breathed her last despite the medical aid and Lord's prayers. The author became a rudderless boat groping in the vast waters of the world. With an innocent son, the only earthly support and hope, the author spent days and days, dazed, horrified and completely defeated. His sustaining activities were his job that kept him fairly busy and the hope of his son's future. Days rolled on, weeks turned into months, months to years and years into a decade. The mystery of life has not yet - in fact never - been understood except by seers. "Wasn't there in God's huge world a small place for my wife?" I used to think. But who, except He alone, can listen to the soulful cries? Tears rolled down several times, dried by cold breeze, washed by more tears. Nothing will bring back the dead wife, the mother for my son, the unseen mother-in. law for my daughter- in-raw and the unseen grandmother for my grand-children. My grand- daughter very innocently, but philosophically, asked me today morning, "Dada (that's what they call me by) why don't you cry today?" Indeed "Yes". What tears will bring back solace to a broken heart? I didn't answer. Jocularly I told her to cry. The child's innocence has meaning. Tears do make one's sorrow light. But the author's sorrow is heavier than a mountain, and indelible like fast colour. He remembered the best way to "cry" - to write something great to the sacred memory of the dead. Here's what he has done. Having soaked himself in the astounding life-story of Jagannath Dasa, the author considers it his bounden duty to translate Jagannath Dasa's magnum opus, Harikathamrutasara into English. To understand Harikathamrutasara, its beauty and poetic and literary grace itself is an achievement bestowed upon the reader by God; to translate it into English, a language that is culturally, philosophically different is indeed a laudable exercise almost verging on foolhardiness. Guru Madhva's Dvaita philosophy has been explained, re-explained, simplified and exemplified by a host of very able and illustrious scholars ranging from the redoubtable Jayatirth, Vyasatirth and Raghavendratirth to many others. 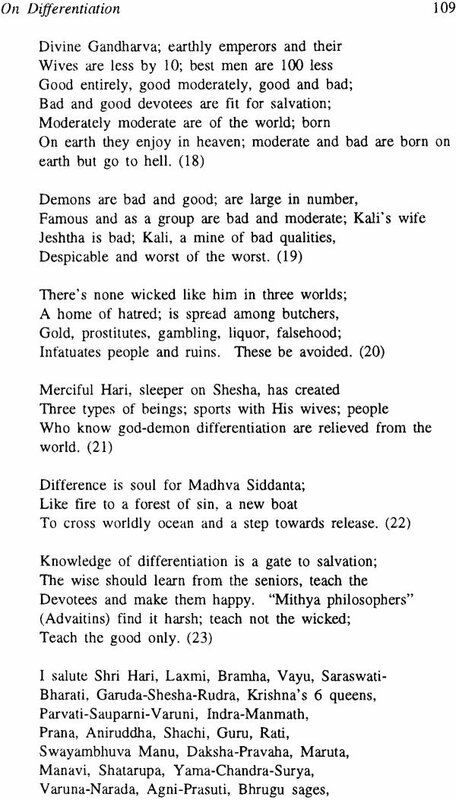 Still Pandits scratch their brains to comprehend many propositions, illustrations and explanations. The very philosophy passes beyond a common man's powers of understanding. To realise it in Jagannath's Harikathamrutasara requires a high standard of mental and moral capacities. Is it not, therefore, the height of ignorance to translate it into English for readers to enjoy the beauties of the great Dasa's poem? Is not the author trying to do the impossible in his life? The only consolation is, perhaps, Jagannath Dasa may have given the author a major portion of his grace, scholarship and knowledge. This may have prompted the author to undertake the stupendous task of translating the poem into English. The author in all humility, accepts the fact - (If the Lord wills, what is impossible to achieve?). At the height of his glory Jagannath Dasa visited Mysore and was honoured by the Court. This happened at the fag end of his career. 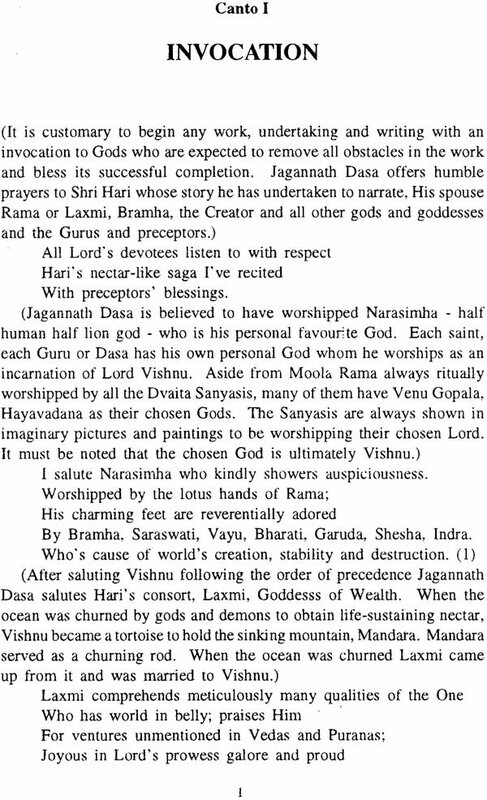 Jagannath Dasa then settled at Manavi and did not undertake further journeys. He devoted a major portion of his time to writing. 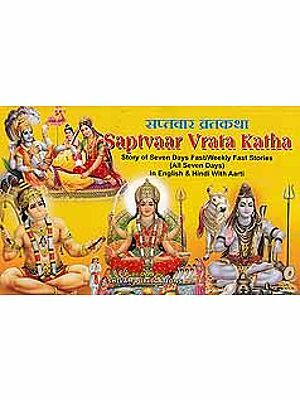 It is strongly believed that during this period the Dasa one day had a dream in which Shripadaraja, Vyasaraya, Vadiraja, and Purandara Das appeared and advised him to undertake the writing of a book on the Dvaita philosophy. "Write in Kannada a book that would, like Shrimun Nyaya Sudha of Jayatirth, explain the intricate philosophy of the great Madhvacharya," said the saints to Jagannath Dasa. "You are capable of doing it and must accomplish it," they said. The orders of the dream were accepted and Jagannath Dasa prayed to the Lord to give him intellectual and physical strength to complete the work. In his humility he has said in Harikathamrutasara "I am writing this story of Lord Hari with the kindness and grace of my Gurus". The work, ordered by the Gurus was commenced immediately and was entitled Harikathamrutasara, the essence of the nectar of the story of Hari. The first part of Harikathamrutasara (Harikatha for short) was started at Manavi when Jagannath Dasa was nearly eighty years old. Though old and physically weak the Dasa started writing, the magnum opus, Harikatha. It is said that his hands used to tremble, his eyebrows, now become loose, expanded skin were covering his eyes, the entire body was emaciated. The Dasa's disciples used to lift the loose skin of the eyebrow and the trembling hand was steadied. "Why, Sir, are you writing in this condition?" asked Jagannath Dasa's disciples. "Why don't you rest? You are eighty. You have already done your work," they continued. Jagannath Dasa smiled at the disciples. Most lovingly he said: "Dear disciples, do you think I am writing this? It is the Lord because of His desire to spread the knowledge of His creation and because He wants to bless all souls, has been Himself writing through me. The Lord is putting the words in my mind and moving my hands to write. I have to obey Shri Hari's dictates." The words satisfied the disciples. 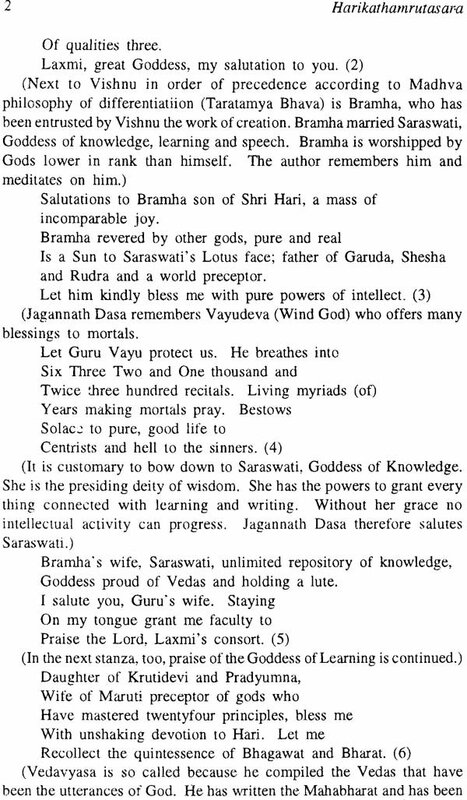 The Dasa wrote the great work to propagate Dvaita Siddhanta and the greatness of God. 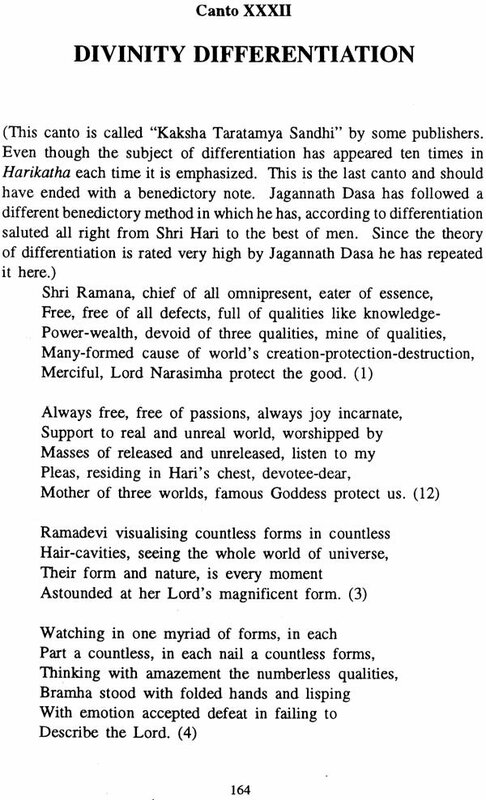 Harikathamrutasara is recited in every house and is listened to with reverence. 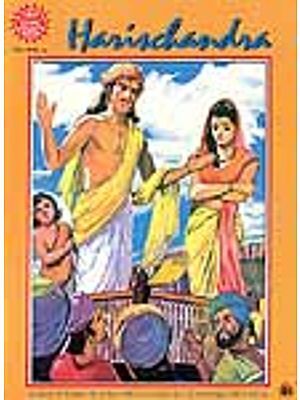 It is strongly believed that after the first part of Harikatha was written, Jagannath Dasa moved to a village named Konanatambige in Haveri Taluka of Dharwad district. The village is on the bank of the river Varada. It is a smallish island, a place very good for serious writing activity. It was here at that time the pontiffs of Raghavendra Swami Mutt Shri Dhirendratirth and of Uttaradi Mutt Shri Satyabodhatirth spent their time and used to invite Jagannath Dasa for philosophic discussions. 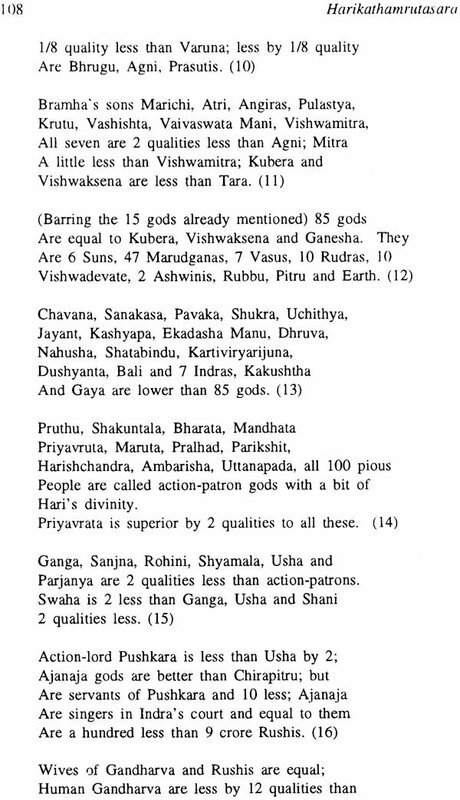 On the island was written Harikatha in thirtytwo cantos - and containing 988 stanzas. The work was ready except for the traditional benedictory canto. The Dasa was about to write the final canto when again he had a dream in which the Gurus prohibited him from writing the benedictory canto. "Don't you do it. It is reserved for your disciple. Find him out," thundered the voice in the dream. But where to find a disciple? What clues had he? These thoughts tormented Jagannath Dasa.